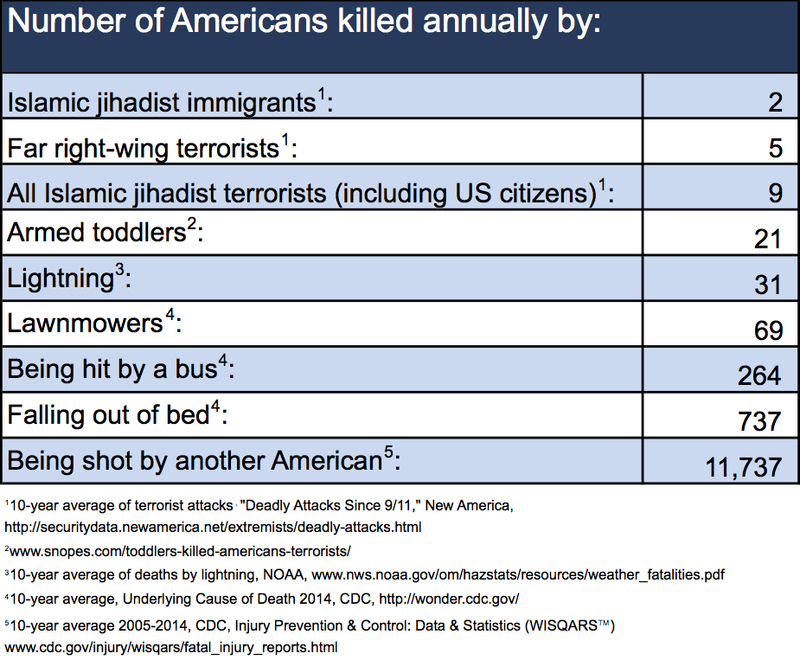 I think traffic deaths are significantly worse than gun violence. Anon: "I think traffic deaths are significantly worse than gun violence." First: Let's differentiate between deliberate violence and accidental deaths. Unlike motor vehicles, guns are designed to kill and deliberately used to kill. Second: A lot of safety laws and regulations govern motor vehicles; Similar effort is needed for guns. Third: Road fatalities in US are declining because of safety equipment and enforcing laws; gun deaths are rising due to lack of regulation and enforcement. What good is any article on gun violence without even a mention of the Second Amendment and how any proposed changes in law can work given that? Syed: "What good is any article on gun violence without even a mention of the Second Amendment and how any proposed changes in law can work given that?" Rights to life, liberty and pursuit of happiness are the most basic rights embedded in the US constitution in that order. No other right is absolute. US Supreme Court has frequently re-interpreted the bill of rights over the last two centuries. It all depends on what the public opinion says on a certain issue. So the key is what I said in the post: "I hope the President will continue to use his bully pulpit to highlight the problem of gun violence and persuade Americans to not vote for those in US Congress who oppose gun control legislation. I also hope that other individuals, organizations and the mass media will support Mr. Obama's campaign to bring about a sea change in American thinking about gun rights"
When a store sells something to someone they shouldn't—a gun, for example—should that store be held responsible for damages caused by that product? This week, a jury in Milwaukee ruled in favor of two police officers who sued Badger Guns after finding that the store broke the law when it sold a gun to the friend of an 18-year-old man who could not legally buy a gun. The teen paid a 21-year-old acquaintance $40 to accompany him to Badger Guns and purchase the weapon for him. It's a practice known as a "straw purchase"—when an individual knowingly buys a gun for someone who cannot purchase a weapon. A month later, the teen in question, Julius Burton, shot two police officers—one was left with brain damage; the other was seriously wounded in the face. The jury, which found that Badger Guns had been negligent when it appeared clear Burton's friend was purchasing the weapon for him, ordered the store to pay nearly $6 million in damages to the officers. The Milwaukee Journal Sentinel calls the outcome a “first-of-its-kind verdict,” and gun-control advocates believe the ruling will encourage more victims and lawyers to sue gun stores that make questionable sales. San Bernadino shooting was the 355th mass shootings of the year 2015 in America. 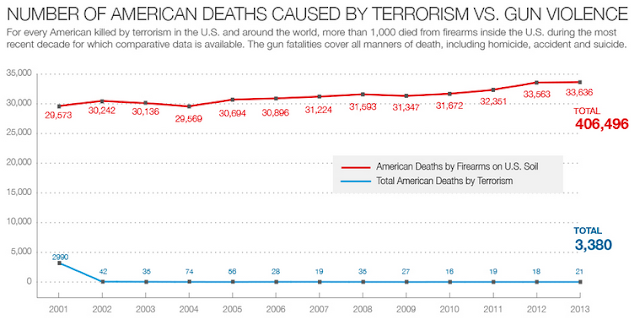 About 400,000 Americans have died from gun violence since 911 in America. There have 355 mass shootings in 2015 so far, all by white gunmen with the exception of 2 this year which were carried out by Muslim gunmen. An armed militia group has taken control of the headquarters building at the Malheur National Wildlife Refuge in southeastern Oregon and intends to stay there for a year, the Oregonian newspaper of Portland reported Saturday. The takeover followed a peaceful protest Saturday in which hundreds of demonstrators gathered in support of two local ranchers who are due to begin a prison sentence Monday. No one was hurt in the takeover, according to initial reports, and the wildlife refuge center was unoccupied at the time. Militia leaders included Ammon Bundy, son of Cliven Bundy, the Nevada rancher and anti-government activist, as well as two of Ammon Bundy's brothers. The exact number of militia members inside the building wasn't immediately clear, though media reports have estimated that at least 150 protesters are inside in support of Steve Hammond and Dwight Hammond Jr.
Dwight Hammond, 73, and his son Steven, 46, were sentenced to five years in prison in October for illegally setting fires on U.S. Bureau of Land Management property near Diamond, Oregon. Both men already served time for the offense, which involved setting fires that spread to government lands they leased to graze cattle, but another judge ruled that both must go back to prison because their initial sentence was too short. “Neither Ammon Bundy nor anyone within his group/organization speak for the Hammond family,” the Hammonds' lawyer, W. Alan Schroeder, wrote to Harney County Sheriff David Ward, as quoted by U.S. News and World Report. Residents in the nearby town of Burns have spent days meeting with out-of-state militia leaders, who have also come from Idaho, Montana and elsewhere, in an attempt to prevent the scene from ending in violence. Omar Khatab, the owner of the California-based satellite channel Payam-e-Afghan, said in an interview that Seddique Mateen occasionally bought time on his channel to broadcast a show called "Durand Jirga," which focused in part on the disputed Durand Line, the frontier between Afghanistan and Pakistan demarcated by the Indian subcontinent's former British rulers. Khatab said Seddique Mateen's political views were largely anti-Pakistan. A YouTube channel under Mateen's name had more than 100 videos posted between 2012 and 2015. One of the videos refers to the "killer ISI" - the acronym for Pakistan's main military-run intelligence service - and says the agency is the "creator and father of the world's terrorism." U.S. officials have accused Pakistani intelligence of backing violence against U.S. targets in Afghanistan, although Pakistan denies the allegations. U.S. officials cautioned that they had no immediate evidence of any direct connection between the Florida attack and Islamic State or other foreign extremist group, nor had they uncovered any contacts between Omar Mateen and any such group. Seddique Mateen interviewed Ghani in January 2014, eight months before Ghani became president, according to a video posted on his YouTube channel. The interview touched on economic development and youth unemployment in Afghanistan. Khatab said Mateen conducted the interview in Kabul and brought it to California for broadcast. During the interview Mateen praised Ghani but by the following year had changed his views, apparently angered by Ghani's outreach to Pakistan in his bid to start peace talks with the Taliban. In a 2015 video, Mateen declared his own candidacy for the Afghan presidency, even though there was no election at that time. In the videos, he wears a Western suit and tie and speaks Dari, a dialect of Persian spoken in northern Afghanistan. He harshly criticizes Ghani's policies both at home and abroad and lashes out at Pakistan, its intelligence service, former Afghan President Hamid Karzai, and some senior Afghan government officials and jihadist figures. In a February video on his Facebook page, he addresses Taliban members and castigates them for being the "servants" of the ISI. In a June 11 video posted on Facebook, Mateen is dressed in military fatigues and says Afghanistan must "punish the traitors." "I wish a hero one day removes Ashraf Ghani's turban and slaps this crazy man," he said in the video. "This traitor has rolled up his sleeves to destroy our country." On Twitter, Ghani condemned the Orlando attack and called it an "act of terror." The attack at an Orlando nightclub early Sunday was the deadliest mass shooting in United States history. One out of every three people at the Pulse nightclub was killed or injured after the shooter, Omar Mateen, opened fire. Mass shooting fatalities are often higher in large, crowded spaces that are somewhat confined, making it hard for people to escape, said J. Pete Blair, a Texas State University professor who trains law enforcement officers to respond to shooters. The noise may have also played a factor: When Mr. Mateen started shooting, one patron said he first thought the gunfire was firecrackers; others said they thought it was part of the music. “Without available avenues of egress, it seems like they didn’t have an easy way of getting out,” Mr. Blair said. The police did not stop the gunman until three hours after Mr. Mateen started shooting, an unusually long time, Adam Lankford, a professor at the University of Alabama who studies mass shootings, said. At some point after the first shots were fired, Mr. Mateen went outside the club and later returned, creating “a hostage situation,” Chief John Mina of the Orlando police said. It is unknown if the shooter killed more people as the police prepared for a confrontation. The amount of time it takes law enforcement to respond can be a strong predictor of the number of fatalities, Mr. Lankford said. He pointed to the mass shooting at Columbine High School in 1999, when police needed more than three hours to reach injured people, resulting in the deaths of some who desperately needed medical assistance. The gunman was armed with an AR-15-type semiautomatic rifle and a 9 millimeter handgun, Chief Mina said. An example of an AR-15-style semiautomatic rifle. The make and model of the rifle has not been released. AR-15s, which were first developed for the military and used extensively in the Vietnam War, are widely owned by assault-rifle enthusiasts. The rifle, which can rapidly fire multiple high-velocity rounds, has been used in a number of mass shootings, including those in Aurora, Colo.; Newtown, Conn.; and San Bernardino, Calif. The rifle is legal to buy in most states, including Florida. In 1994, Congress passed an assault weapons ban, which expired in 2004, that prohibited manufacturing the AR-15 for civilian sale with large-capacity magazines, bayonets or pistol grips. In a video taken by a bystander at the Orlando shooting, more than 20 rounds can be heard being fired in rapid succession. Like most states, Florida does not restrict the capacity of magazines. State bans have been ineffective: purchasers can cross state lines and AR-15s with limited-capacity magazines can easily be modified to accept larger magazines. The shooters in San Bernardino used high-capacity magazines despite California’s ban on semiautomatic rifles with magazines of more than 10 bullets. Only two mass shootings are known to have killed more people: a 2011 attack at a Norwegian summer camp, and shootings by a lone gunman in South Korea in 1982, according to research by Mr. Lankford. The research includes attacks dating back to a massacre at the University of Texas in 1966 that is often considered the first modern mass shooting. DeSai, who received his law degree from the University of Tulsa in 1998, started a small law firm but his former law partner, Ken McDaniel, said they closed it about six months ago. McDaniel told local television the shooting was "out of character" for DeSai. Houston Mayor Sylvester Turner, in Cuba to develop trade relations, told reporters, "The motivation appears to be a lawyer whose relationship with his law firm went bad." Prakash DeSai told ABC television's Houston affiliate that his son drove a black Porsche, and that he was "upset about his law practice not going well" and money woes. Police said the suspect was dressed in a military-style uniform and that military paraphernalia that included Nazi items was found in his possession. The police bomb squad secured the shooter's car, which contained more than 2,600 rounds of ammunition. Police said a handgun was found on the suspect's body and a rifle was found in this car. A man who injured nine people in a shooting rampage in Houston on Monday was wearing military clothes and Nazi emblems during the attack, and was carrying nearly 2,600 rounds of ammunition inside a Porsche convertible parked at the scene, authorities said. The gunman, identified by local media as Nathan DeSai, 46, was shot and killed by police after he opened fire on morning commuters near a strip mall in a mostly residential neighborhood west of downtown. Police did not publicly name DeSai as the shooter, but the Houston Chronicle and KTRK reported that they had confirmed his identity with officials. The shooter was carrying a .45-caliber handgun and wearing “military-style apparel” during the shooting, with vintage Nazi emblems on his clothes and “on his personal effects,” police said in a news briefing Monday afternoon. A search of his apartment, which is several blocks from the scene, turned up similar military memorabilia going back to the Civil War, police said. A bomb squad that searched his black Porsche convertible uncovered a Thompson submachine gun — commonly known as a Tommy gun — and nearly 2,600 rounds of live ammunition, according to police, who said he purchased both of his firearms legally. Police also found a sheathed knife, a notebook with a Nazi symbol and 75 spent shell casings on the scene. Dont register Muslims, register guns. You'll save more American lives. At least 410 people lost their lives daily in road accidents across India last year compared to 400 lives in 2015. On the other hand, the rate of rise in fatalities came down in 2016 compared to the previous year. Data accessed by TOI showed nearly 1.5 lakh people were killed in accidents last year compared to 1.46 lakh in 2015. India has recorded the maximum deaths in road accidents. Barring Mizoram and Union territories of Chandigarh, Daman & Diu, Dadra & Nagar Haveli, all other states and UTs have shared data with the Centre and the Supreme Court Committee on Road Safety. "The provisional data is a cause for concern as we're trying to stabilise the number of fatalities and injuries and reduce them subsequently," an official said. "If only Stephen Paddock had been a Muslim … If only he had shouted “Allahu akbar” before he opened fire on all those concertgoers in Las Vegas … If only he were a member of ISIS … If only we had a picture of him posing with a Quran in one hand and his semiautomatic rifle in another ….... Then we know what we’d be doing. We’d be scheduling immediate hearings in Congress about the worst domestic terrorism event since 9/11. Then Donald Trump would be tweeting every hour “I told you so,” as he does minutes after every terror attack in Europe, precisely to immediately politicize them. Then there would be immediate calls for a commission of inquiry to see what new laws we need to put in place to make sure this doesn’t happen again. Then we’d be “weighing all options” against the country of origin." “Bigotry in any form is blasphemy against the American creed......Too often, we judge other groups by their worst examples while judging ourselves by our best intentions..... Bigotry seems emboldened. Our politics seem more vulnerable to conspiracy theories and outright fabrication."